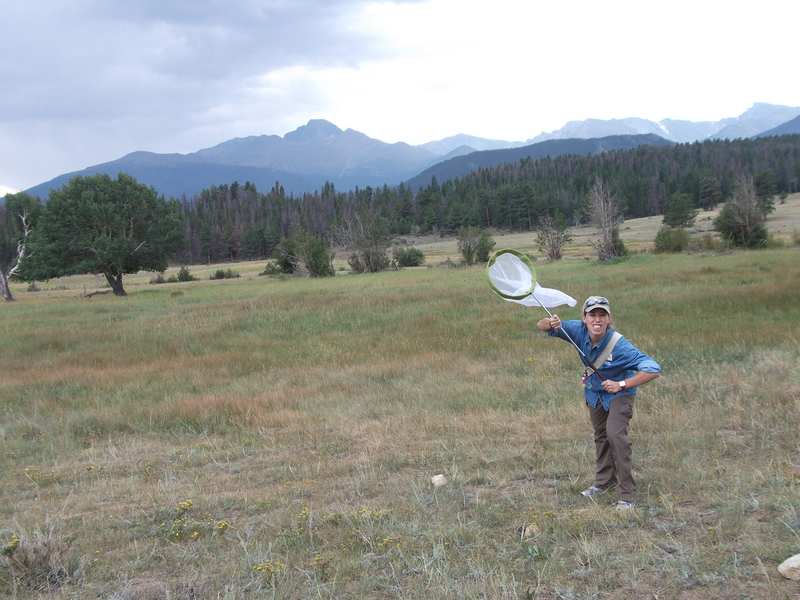 Last month I participated in Rocky Mountain National Park’s ‘BioBlitz’ Species Inventory. When I took German in high school, I learned that “Blitzkrieg” means “lightning war,” so that is what came to mind when my friend and fellow melittologist, David, asked if I wanted to join him at this event. And in fact, “lightning war” isn’t too far off as a way to describe this weekend biology frenzy. On Friday, August 24th, 2012, hundreds of scientists and naturalists and thousands of citizens and students descended on the normally protected landscapes of Rocky Mountain National Park to search and pillage for species. Well, count me in! When I followed David’s link to register for this event, I was hesitant to designate myself as ‘an expert’ in entomology. What do I know about Colorado pollinators? It is, I admit, my home state and I’ve been to Rocky Mountain National Park many times, but that was before my bee-wrangling days. I’m just a measly grad student! And the majority of my bee knowledge has come from distant, different California. But David, and also my adviser, convinced me that I was up to the task…or at least I should be. So I packed my collecting nets, killing jars, and data book and boarded a plane for Denver. The Biodiversity Festival is the tailgate party for a Bioblitz. It boasts “a full schedule of music, ranger programs, live animal demonstrations, photography workshops, poetry, and talks by leading scientists.” I met David in the parking lot and we wove our way through the crowd and into the tent of biodiversity. I picked up a biodiversity map, some fliers on bats, and a few note cards about whales, but I was most impressed by the decks of cards National Geographic was handing out, each card with a cartoon and description of a National Geographic Explorer’s contribution to science and adventure around the world. From discovery of deep sea bioluminescent animals previously unknown to science, to inventive research on bees in Kenya, fifty-two are not enough! Match your jump to that of a certain frog species! I, sadly, did not try this. Time to get down to bee business. We collect our name tags, official stylish NatGeo denim shirts, and head out to find “Upper Beaver Meadows” our assigned collecting location. Unfortunately, our assigned collecting time was 4pm, or in other words ‘bee quittin time.’ This I knew to be especially true in the Colorado Rockies, where you can almost set your watch by the afternoon storm clouds. Contrary to their reputation (often deserved) of being perpetually busy, bees are also fickle creatures. They don’t like to work when it’s too cold. They stay at home when it’s too windy or wet. And they usually don’t bother to do much when it’s cloudy. When I decided to work on bees for graduate school, I thought this sounded like an ingenious field schedule for me too (I did not, however, consider that bees LOVE to fly when it’s 110 degrees, which means I get to chase them around then too.) Despite the cloud cover, David and I set out our pan traps, for a chance at passive collecting, and navigated towards the meadow blooms with our nets. I am ready, but the bees are nowhere to be found. Photo D. Drons. When the busload of visitors who signed up for the ‘BeeBlitz’ arrives, we still don’t have much to show them. We caught a few Megachile, a couple Dialictus, an Anthidiine, a parasitic Coelioxys, and what I like to call the ‘stalker wasp:’ a large, very fast greenish-yellow insect that seems to like to dart around you while you are trying to focus on collecting and is infuriating to try to catch (actually called a Bembix). The eager citizen scientists don’t seem to mind our measly collection though. We gather them in a circle, break out some of our favorite illustrated bee texts, and explain the world of bees: “There are nearly twenty thousand different species of bees in the world. Some are bright green or metallic blue, some are the size of ants. Most of these are solitary and live only one bloom season. This also means that most bees do not make honey, which is intended to sustain a hive through the winter. The solitary female works diligently during her 3-4 week lifespan to dig and provision a nest for her young, which will overwinter underground and emerge to do the same the next year. Many species of bees have very specific floral preferences. Without bees our diets and wildflower displays would be very bland. And no, unfortunately they don’t generally come out when it’s cloudy.” We give them a quick introduction to a taxonomic key, and pass around the few specimens we’ve garnered so far. We then show them some collecting technique and let them try out the nets. Then, all of a sudden, the sun comes out! One of the young girls in the group turns out to be a sharp collector and almost immediately nets several Megachile that seemed to appear out of nowhere with the sun. We get them into a collection vial and show her that the underside of the female’s abdomen is covered with bright yellow pollen. Rather than packing pollen onto ‘pollen baskets’ or bare spots on her hind leg as a honey bee does, this bee has its scopal pollen-collecting hairs on its abdomen, a less efficient but visually striking mode of pollination. She is likely collecting pollen to provision a nest that she has laboriously hollowed out from the ground or a twig. She may have already constructed a cell, much like an empty pill capsule, out of leaves in which she will place this pollen food and lay her egg. She will try to fashion and stock as many of these cells, all arranged in a column in the nest, as she can before she, or the flowers, die. It is possible that, while she is here in our vial, a cleptoparasite is entering her nest and laying its own egg that will hatch, kill hers, and consume this pollen instead. Catching this bee tells us a story about this meadow and how its parts weave together to create this habitat. At least we have one show-and-tell story on this cloudy afternoon. The girl is thrilled and runs off to hunt down another discovery. David answering questions like a pro (because he is one). Photo J. Meiners. At the end of the day, we only have 13 specimens to turn in to the BioBlitz Species Inventory, a disappointment for two seasoned collectors. But ours adds to the collections pouring in from other denim-clad scientists sent to other reaches of the park. 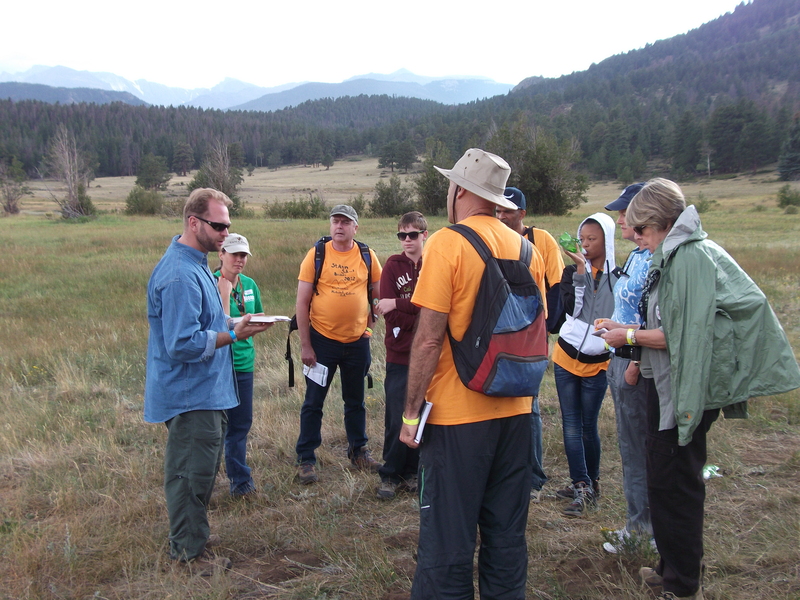 In total, the Rocky Mountain BioBlitz tallied 489 species of plants and animals in a 24-hour period. Pretty solid work for a cloudy day. And, having been able to answer everyone’s questions and inspire a group of aspiring naturalists to pay attention to the smaller things in the field, I can pack up my collecting supplies with a sense of accomplishment too. Though I’ve been visiting it much of my life, Rocky Mountain National Park has now shown me a few more of its secrets and allowed me the joy of sharing them with you. Hail the biology lightning war! PhD student, science writer, bike racer, nomad. Focusing on native bee community ecology, literary nonfiction outreach, and exploring the world on two wheels. Currently at the University of Florida. Formerly at Utah State University and Mount Holyoke College. Twitter @beecycles. This entry was posted in Bees, Collecting. Bookmark the permalink.